Scopri il Parco Nazionale Tierra del Fuego e i suoi paesaggi spettacolari in questa escursione di mezza giornata da Ushaia. Il parco nazionale più meridionale del mondo comprende ghiacciai, laghi, montagne e una ricca fauna selvatica. Scegli uno dei due tour Tierra del Fuego: esplora in veicolo o tramite il treno End of the World. Dopo il trasferimento dal tuo hotel a Ushaia, viaggerai per circa 11 km (11 km) fino al Parco Nazionale della Terra del Fuoco, osservando lo scenario che si modifica passando per la periferia urbana. Passa splendidi corpi d'acqua della Patagonia e presto ti imbatti nel maestoso Monte Susana. La vecchia prigione, ora sede del treno End of the World, segnerà il punto di partenza per l'opzione del veicolo o del treno. 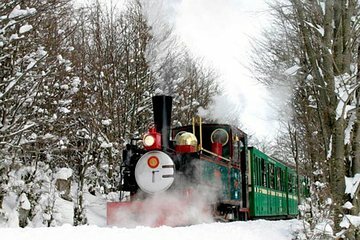 Prendi il treno e goditi il panorama mentre la ferrovia ti porta attraverso torbiere e ponti prima di fermarti alla Macarena Waterfall Station, dove scoprirai le popolazioni indigene della regione, la Yamana. Arrampicati su un belvedere panoramico, quindi continua il tuo viaggio in treno turistico attraverso il parco, fino alla vecchia segheria. Continua la tua escursione verso la scintillante baia di Ensenada, dove vedrai le rocciose isole Redonda ed Estorbo, oltre alle maestose e innevate montagne di Sampaio. A Roca Lake, serpeggia lungo il fiume che scorre lentamente verso Condor Hill, quindi fermati alle altre Green e Black Lagoons. Al termine della tua avventura, verrai ricondotto al tuo hotel a Ushaia. Dopo aver trascorso del tempo nella prigione ormai defunta, girate la stazione ferroviaria End of the World, guidate attraverso la pittoresca valle verso la baia di Ensenada. Visualizza le montagne di Sampaio e le isole Redonda ed Estorbo. La prossima tappa è il Lago Roca e un viaggio a piedi lungo il fiume Lapataia verso Condor Hill. Dopo esserti trasferito a vedere la Laguna Verde e la Laguna Nera, visita una torbiera in crescita. Quando la tua escursione sarà finita, verrai restituito al tuo hotel Ushaia. Um belo passeio com paisagens muito bacanas. Vale a pena! This was a good tour for those with limited time to enjoy the national park. The guide was very knowledgeable and helped us understand some of the history and ecology of the area. Enjoyable outing, although hotel failed to pass on later pick-up message. Good informative guide on coach. Train bit touristy as expected, but well-organised and good on-board commentary. Later guided walk and tour to lakes added to experience and knowledge of the region. Fantastic trip. The Train ride was the highlight. Would have been nice if the tour pre-purchased our tickets for us so that we don't have to waste time queuing up for the tickets and not have enough time to look at the station and exhibits which looked very interesting. It started off on the wrong foot. I was told that I would be picked up in the morning at my hotel but the night before the hotel received a call that I now needed to make my way into town to be picked up at a central place. This was an added 20 USD price for me as I was staying outside of town and needed to now take a taxi. As for the park tour - I was expecting that by spending a half day in the park you would spend time in the park walking, hiking. There was a total of 35 minutes allotted for walking in the park - the rest was driving around. Last but not least it was an 'English guided tour' unfortunately the majority of details were given in Spanish - the English version was significantly trimmed town to bare bones comments. We were actually asked while at the main lookout point reviewing the map if we needed to hear the English version or if the Spanish version was good enough? Overall thoughts are that it was very expensive for what you got. Would recommend that you book in town or hire a taxi to take you there and pick you up. Will cost much less and the experience probably much greater, unless riding buses is your thing. This was a lovely tour with beautiful scenery and a guided walk through the park as well as some free time to take pictures and get a PENGUIN stamp on our passport at the END OF THE WORLD little post office. I didn't do the optional train ride...so cannot speak to it. I only had one day to see the national park so this was a good way to get an overview. I did not do the train ride beaus I felt I would see more of the park without that. We did get out and walk a little bit in a few places which was nice. We weren't just driving past scenery in a bus.